I might get kicked out of the cool kid’s club for this, but I really don’t like “West Side Story.” The music is old, the dialogue is way out-dated, and my professional wrestling background doesn’t tolerate dance-fighting super well. It’s also hard to cast the show; most of the time it’s just a bunch of white people pretending to be Puerto Ricans and failing miserably. So, needless to say, I wasn’t beating down the door to get tickets when The Carnegie announced they were producing the show last fall. But – like a good little theatre advocate – I got ahold of one of my favorite box office managers, Brenda, and requested my media comps. Then I saw the cast list and I perked up a little. This might be OK, I thought. Eric Vosmeier and Paul Morris as cops? Intrigued. Darnell Pierre Benjamin going back to his roots as a dancer? OK, yep. Some Wright State kids who I’ve watched “grow up” over the years? Uh huh. CCM Opera people in the leads? I’m coming, OK! Stop! And truth be told, it’s far from a perfect production, but I found myself enjoying The Carnegie’s WEST SIDE STORY far more than I thought I would. It’s difficult to produce a show like this on a stage the size of The Carnegie’s. Big dance numbers need space and you don’t have an abundance. But choreographer Jay Goodlet works hard to utilize the area he has and maximize the talent that was cast for him. There is some fine dancing here, especially from ensemble members Keaton Eckhoff, Kate Mueller, Tyler Kuhlman, and the above mentioned Benjamin. Vocally, the cast is strong, as it should be with a musical. I’m glad Kevin Semancik was behind the sound board, as he is one of the few (and perhaps the only one) who’s figured out how to make this space audible. Without the use of amplification during the non-musical portions of the show, though, it was difficult at times to understand the dialogue, especially when affected by thick accents. Everyone knows The Carnegie has bad acoustics; Semancik’s name in the program always gives me some hope. The show comes alive when “Maria,” the beautiful Abigail Paschke, opens her mouth to sing for the first time. My “plus one” leaned over and said, “Oh, this is going to be good” at that moment. Her chemistry vocally and otherwise with “Tony,” her handsome leading man, Marcus Shields, feels authentic and believable. And their duets are stunning. Layan Elwazani will be a giant star. And soon. Mark my words. 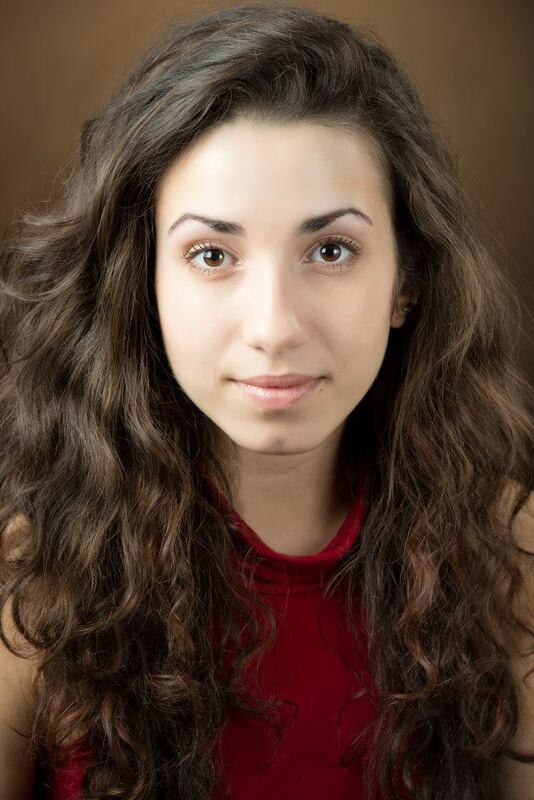 For me, though, the star of the show is Layan Elwazani as “Anita.” Elwazani is a senior theatre major at Wright State University and you can write this down – she will be a superstar of stage and/or screen in the near future. Her natural charisma makes it difficult to look away when she’s on stage and when you factor in her immense talent, professional ability, and feisty attitude, she’s poised for greatness. Her facial expressions, her timing, her ability to be funny and sassy and later vulnerable and angry while maintaining the integrity of the character is one of the best things about this show. Director Brian Robertson should be proud of what they were able to create together with her supporting role. I also enjoyed the performances of Kate Mock Elliott, Kathryn Miller, Alison Edwards, Brandon Huber, Drew Simendinger, and Tina deAlderete very much. And Mike King, with his intense likability, is always a breath of fresh air on stage. The orchestra sounds amazing, under the direction of William White. Wes Calkin’s lighting and set design serve the show well, though there was a moment when I feared the set piece would not stand up to the weight of both actors climbing up and on it. Joy Galbraith’s costumes are period-appropriate and fit within the overall style of the show. The first act runs an hour and a half, so be prepared. And there are some choices made in staging and casting that cause me to ponder exactly how and why they were made. Yet, overall, this show is sure to be another hit for The Carnegie and that a is a wonderful thing. Especially for brand new theatre director Maggie Perrino, who’s spunky vibe is a welcome addition to the team. I’m looking forward to her curtain speeches, sooner than later, please. And it was nice to see her proud Papa – that other theatre director named Perrino – there to support opening night of her first production in her new role. I’m excited to see where she takes this grand old place. 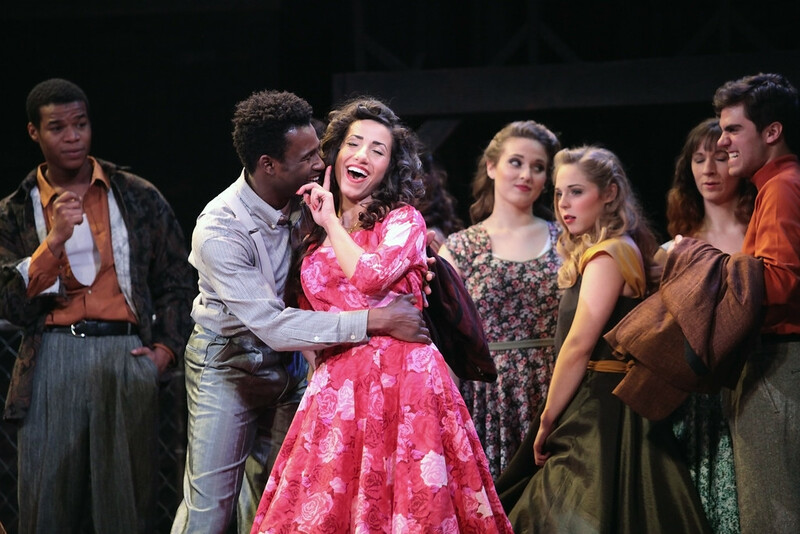 WEST SIDE STORY runs through January 18th. Tickets are selling like hot cakes so don’t hesitate to grab yours now. Click here or call the Box Office (and talk to Brenda!) at 859.491.2030 for more information. Oh, and tell them that you heard about the show from The Sappy Critic since I’m no longer listed on the survey!